Beef RENDANG surely you know this cuisine, yap true even very often we eat. On the day of Eid is also great as it is usually in every household can certainly make them eat-do with a family gathering. Do not just eat talaga cuman donk but also pelajarin how making so any time you want to make it later so stay rendang padang collect materials talaga. Beef rendang this time use of beef and cooking was a typical desert. Well you are already impatient would like to know more continue to refer to ya.n No. 1 in Indonesia. Cut the beef with ukurn being. Boil the coconut milk with spices that have been refined. Put kandis acid, lemongrass, turmeric and lime leaves. Stir constantly until thickened and coconut milk not broken. If it starts to boil input pieces of meat. Use medium heat only and while stir until cooked. 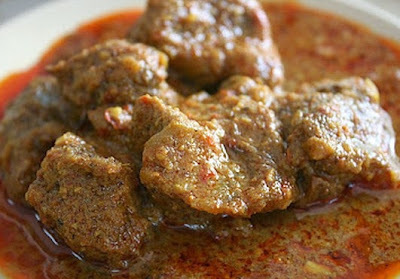 Our tips for recipes beef rendang padang this is when you bikinnya that boiled milk was not broken stir slowly. And do not cut into the meat too thick because it will be difficult seasoning seep into the meat. Deh and easy to loss if you can not make sense according to what you want.